CITRINE BRAZILIAN STONES!!!! . :: VR STONES ::. About the color this classification has 30% percent of red stones, 40% orange and 30% yellow stones. Obs: This Rough citrine Brazil has rounder stones. Obs: This lot of Rough citrine Brazil has rounder stones. Shopping guide: Citrine is a beautiful translucent yellow gemstone. The larger the stone, the more golden the tone. It is a popular and affordable alternative to the much more expensive yellow sapphire or yellow diamond. To create wondeful multi-colored jewelry, it is often combined with other stones such as: peridot, amethyst, and garnet. Citrine is often marketed under various names that confuse it with topaz to inflate its price. It may be distinguished from topaz by its inferior hardness and from decolorized amethyst by its lack of reddish cast. Citrine is any quartz crystal or cluster that is yellow or orange in color. Although often cut as a gemstone, citrine is actually somewhat rare in nature. 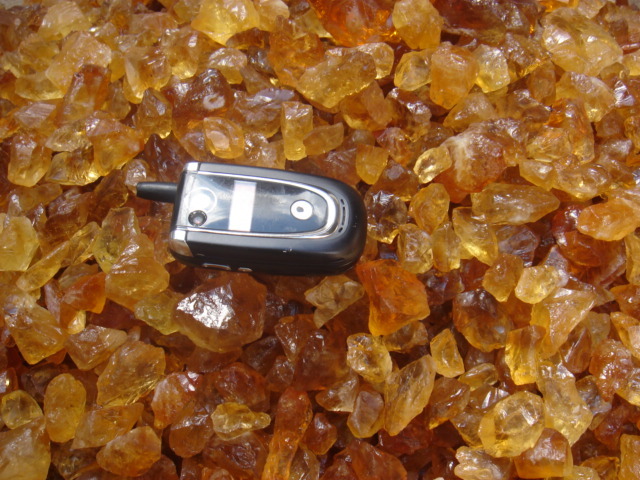 Most citrines on the market have been heat treated. Specimens of low grade, inexpensive amethyst or smoky quartz are often cooked at high temperatures to produce the more profitable orange yellow citrine. Citrines whose colors have been produced by artificial means tend to have much more of an orange or reddish caste than those found in nature, which are usually a pale yellow. Much of the natural citrine may have started out as amethyst but heat from nearby magmatic bodies may have caused the change to citrine. The citrine geodes available in the trade are always (so far as I am aware) the result of heat treatment of amethyst geodes. Citrine made by heating amethyst may be returned to a purple color by bombarding it with beta radiation. Interestingly, a popular gemstone on the market is a mixture of half amethyst and half citrine and is given the name ametrine, made by heating an amethyst until it turns into citrine, then irradiating a part of the resulting crystal or gemstone to convert that portion back to amethyst. Unfortunately for citrine it is often confused with the more expensive orange-yellow topaz and is at times sold as topaz by unscrupulous dealers. This practice has soured many potential citrine fanciers who see citrine as a fake topaz and not as a legitimate gemstone. •Amethyst is the purple gemstone variety. •Milky Quartz is the cloudy white variety. •Prasiolite is a leek-green variety. •Rock crystal is the clear variety that is also used as a gemstone. •Rose quartz is a pink to reddish pink variety. •Smoky quartz is the brown to gray variety.